Apply now to reserve a spot in one of our upcoming 2019 PKT courses. Are you interested in learning how to implement practices using comprehensive methods and the best available evidence? Potential participants must submit an application form to be accepted in the course. Payments will be required only when participants are accepted into the course. If you would like to discuss whether this workshop aligns with your learning goals and needs, please contact Melissa Courvoisier (CourvoisierM@smh.ca). This course will be offered in both the spring and fall of 2019. *Participants are required to attend at least 1 of 3 coaching sessions. **The in-person workshop will be held at the Li Ka Shing Knowledge Institute of St. Michaels, Toronto. We encourage professionals in any health related discipline (e.g., healthcare, public health, mental health) who are responsible for implementing change to apply. Implementation projects can be broadly defined or at any stage of development. Examples of previous projects applied during PKT include: preventing urinary tract infections in long-term care homes, improving how researchers engage patients in patient-oriented research, increasing hospital mobilization rates, implementing a data-tracking and monitoring system to reduce perinatal mortality in Ethiopia, increasing primary care guideline adherence, and changing organizational email practices. To apply online, or by downloading and emailing us a hard copy application form found here. • The cost includes introductory webinar, 5 day in-person workshop, in-person coaching support at the workshop, takehome resources, access to online resources for 2 months, and post-workshop coaching. • Coffee/tea, snacks, and lunch will be provided during the workshop. • The cost does not include travel to or accommodation in Toronto. Upon acceptance into the PKT course you will be emailed information about how to register and pay for the course. 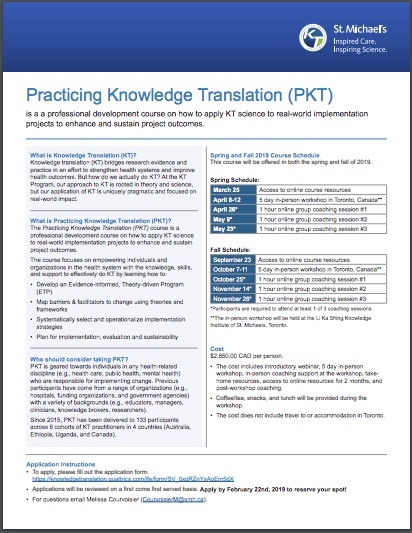 "Practicing KT is one of the most engaging and useful courses I’ve taken. It has equipped me with the theory, knowledge and tools to do effective KT, and to share what I’ve learned with my colleagues. Already, the course has had a positive impact on my organization. I feel excited about what we’ll be able to achieve." "While we were completing the course we were at the same time applying a number of the lessons to support the development of our projects. We have received incredible feedback about these from other departments in our organization, our stakeholders, and other experts in the field."